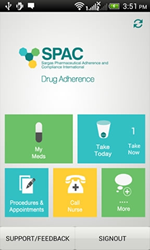 Sargas Pharmaceutical Adherence and Compliance (SPAC) International launches I Phone and Android applications for cancer patients and caregivers to exchange their health information via the cloud applications and portals developed for their physicians and pharmacies. SPAC is offering a special promotion for California medical oncologists through their state society membership of ANCO and MOASC said Git Patel CEO of Sargas. Scheduled preventive service and medication monitoring by SPAC trained staff with custom mobile health applications for patients. 24/7 Patient access to a care team via our cloud portals. After business hours, our staff of nurses and patient’s own care team is available to address chronic care needs. 24/7 Patient care team access (all the physicians will have access to each patient’s medical information via our cloud physician portal and pharmacy portal). There is an opportunity for patients to communicate with their care team by telephone, secure messaging and other communication modalities like email, m health applications and live support. We help in the management of care transitions automated by our electronic exchange of health information via our HIPPA compliant cloud portals. 24/7 access to medical information for care coordination for the patient’s medical team and to support each patient’s psychosocial needs and functional deficits. SPAC International will offer this promotion for all cancer doctors in the country by the end of November. Medicare will only pay for patients with two or more chronic conditions. Please ask your cancer doctor to sign up for free on http://www.spacinternational.com so that you can download the free I Phone and Android Application for your treatment. SPAC will upload your prescription information to the pharmacy of your choice via its pharmacy portal.